Remember “Picture Day” at school where you’d be forced to wear the dress your grandmother bought you for your birthday (with the puffed sleeves) and smile awkwardly for the camera? Well, I also had an enormous hair bow that would have been considered big even by Lady Gaga standards. My mom forced me to wear one, and it kinda traumatized me. No surprise, I steered clear of the bow trend for years … until recently. Click here to see our bow trend roundup. I finally realized bows aren’t just for ruining picture day, and now I’m wearing hair bows, bow shoes, bow necklaces — you name it, I’ll put a bow on it. So I’ve searched all corners of the Internet for the latest in this hot trend. The results? A roundup of bows so cute I’ve practically forgotten about my picture day traumas. Since the bow trend is red hot right now, everyone is putting their own twist on it; Gaga’s infamous hair bow made the trend edgy, and bow-obsessed girls like Katy Perry and Zooey Deschanel give the trend a kitschy, playful spirit. Sure, bows get a reputation for being overly fussy, but they’re not so sugary sweet anymore. 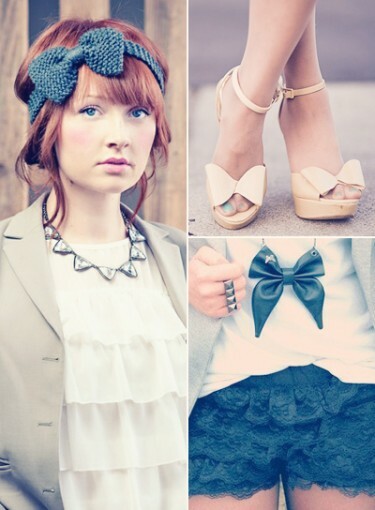 Fact: you don’t have to be an extreme girly-girl to pull off a bow. OK, itching to see some cute bows? Thought so. Keep on clicking.